The walled city of St-Malo is that very rare thing – a Channel port where you could quite happily walk straight from the ferry into town, enjoy a fulfilling weekend break, and then catch the boat back home. Not only does it boast a great array of hotels and restaurants, along with a profusion of history and charm, it even has a wonderful beach as well. Simply step through the ancient gateways piercing its ramparts, and you’re on a huge expanse of golden sand, with shallow sheltered swimming. If the sun goes in, explore the chateau built for St-Malo’s medieval pirate adventurers, the Malouins, whose many exploits included being the first to settle the Falkland islands (thus, Las Malvinas). And when the sun goes down, spend the evening wandering from shop to shop, bar to bar, and browsing luscious menus. While not a single stretch of the Breton coastline is anything less than beautiful, the most dramatic and memorable segment of all has be the Côte de Granit-Rose, slap in the middle of the north coast. The name, meaning “pink granite coast”, might not sound promising, but the reality is stunning. The rocks along the shore are not simply rose-coloured but glittering, and eroded into quite extraordinary shapes. The tiny Île de Bréhat (2), for example, just north of Paimpol, nestles amid giant pink boulders, while further west, around Ploumanac’h and Trébeurden, coastal footpaths lead through menageries of bizarre natural sculptures. Some twenty miles upstream from St-Malo, the perfectly preserved fortress town of Dinan perches high above the river Rance, at the point where it starts to widen into a broad estuary. Dinan’s sturdy ramparts and towers remain impressive, but this is a town of smaller pleasures; cobbled alleyways and squares, top-heavy half-timbered houses that hold cosy bars and crêperies. Above all, the great joy here is the twisting, chest-thumpingly steep Rue du Petit-Fort, which connects the town proper with the riverfront quayside down below. Walking slowly down in the early evening, dawdling in the various galleries en route; savouring a drink and a meal down by the river, spanned here by a little stone bridge; and then walking even more slowly back up again, and passing beneath the mighty gateway to re-enter Dinan proper; that’s what makes Dinan worth a night or two in any Brittany itinerary. Brittany’s oldest city, Quimper, in the southwestern corner of Finistère, began life as the capital of the myth-shrouded kingdom of Cornouaille. Despite the presence of a huge Gothic cathedral, and a souped-up art museum, it still feels like a pretty provincial market town, stretching languidly along the banks of the river Odet, which is criss-crossed by flower-bedecked little footbridges. For most of the year, it’s a pleasant place to stroll, snack and shop – especially for the local glazed, hand-painted faience pottery – but for a week each July it comes alive during the Festival de Cornouaille, a celebration of Breton music and traditions. There’s said to be an island for every day of the year in the Golfe de Morbihan, the almost entirely land-locked “little sea” that eats into Brittany’s southern coast. In truth, land and sea are so intermingled that the only rational way to explore is by boat. The walled town of Vannes, at the inland end of the gulf, is worth visiting in its own right, home to lively bars and restaurants as well as a modern aquarium, but it’s also the home port for a wide array of boat trips both around the gulf and out into the open sea beyond. Prime destinations include minuscule Gavrinis, topped by a megalithic step-pyramid that conceals an ancient tomb, and the largest of the islands, the Île aux Moines, which holds a couple of hotels and some fine beaches. As the ferry heads out into the swirling Atlantic mists, from Audierne near the far southwestern tip of Brittany, you really do feel as though you might sail off the edge of the world. Instead, an hour out to sea, you come to a tiny sliver of land, home to a low huddled village and a solitary lighthouse. At high tide, this gloriously isolated spot, so far from the mainstream that it’s said to have been the last outpost of pre-Roman paganism in France, seems in danger of disappearing altogether. Visit for a day, and you’ll get a real sense of its ongoing traditions; better still, spend a night here, and leave modern Europe far behind. Ten miles east of St-Malo, the little port of Cancale has been famed for centuries for ostreiculture – cultivating oysters on terraces flooded and flushed by the tide. The tides here at the western tip of Mont-St-Michel Bay – yes, the namesake abbey stands silhouetted on the horizon – are among the largest in the world, leaving scores of fishing boats stranded on the silty seabed. Just above, superb seafood restaurants jostle shoulder-to-shoulder along the quayside, so despite the summer crowds you’re sure of getting a good meal. Walk it off afterwards with a bracing hike to the dramatic Pointe du Grouin. Carnac may look like a perfectly ordinary little Breton village, but amazingly enough archeologists consider it to be the oldest continuously inhabited settlement in Europe. Head to the rolling heathlands immediately north and you’ll see why: long, mysterious rows of standing stones (or menhirs, as the Bretons call them), erected in parallel lines long before the pyramids of Egypt. Tucked away in the woods are ancient burial mounds, pierced by eerie tunnels through which intrepid visitors can creep. And for good measure, if that doesn’t appeal, Carnac also boasts magnificent beaches, making it a prime destination for bucket-and=spade holidaymakers. The largest of the Breton islands, Belle-Île, is readily accessible by ferry – high-speed, in summer – from Quiberon and other south-coast ports. Unlike most of its smaller counterparts, it’s hardly a little-known getaway – it’s home to some of the region’s fanciest resort hotels. The main town and port, Le Palais, stands on the sheltered land-facing side, guarded by a mighty star-shaped fortress, while smaller Sauzon is a few miles west. Rent a bike (or a car, if you must) and you can explore the whole island in a day, from secluded sandy beaches in the north to the wild and rugged southern coastline, with its steepling cliffs pounded by the ocean. In the days when it was much easier to travel by sea than by land, Brittany (or “Little Britain”) had close ties with Great Britain across the water. Its interior, on the other hand, was dark and dangerous, covered in legend by a vast forest known as the Argoat. At the heart of the woods lay the enchanted forest of Brocéliande, home to Merlin the magician and supposed site of the Fountain of Eternal Youth. What’s left of that mythic landscape is now the Forest of Paimpont, southwest of Rennes. It’s considerably less wild these days, but from the lakeside village of Paimpont itself you can still enjoy some superb walking; you never know, as well as the odd castle, you just might stumble across the Fountain itself. You can’t really claim to have seen Brittany unless you take a ferry trip out to at least one of its islands – there are hundreds to choose from, from the largest, Belle-Île, down to tiny specks, with only enough room to accommodate a single dwelling. 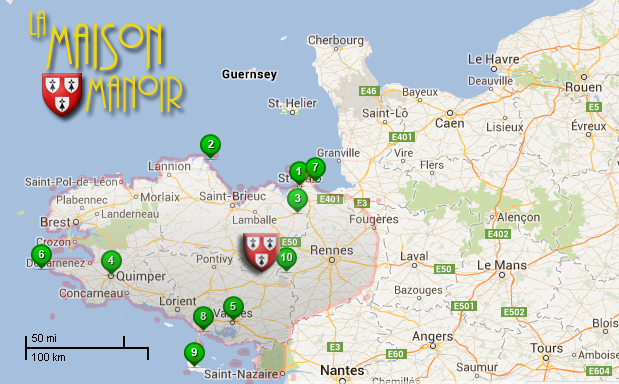 A city-wide jamboree of music, art, dance and theatre, concentrating on Breton culture but also featuring international performers (www.lestombeesdelanuit.com). Known as the Petite Troménie, Locronan’s annual pardon is among the oldest and longest religious processions in Brittany. Every six years – and 2013 is such a year – it doubles in length, to follow a 12km circuit once used in Druidic initiation rites (www.locronan-tourisme.com). Tiny Carhaix, way out west in Finistère, makes an unlikely venue for France’s largest rock festival, but recent headliners have included Bob Dylan, Bruce Springsteen, and Sting (www.vieillescharrues.asso.fr). An extravaganza of Breton music and dance in Finistère’s prettiest city, along with theatre, art and photography exhibitions, and great food and drink (www.festival-cornouaille.com). This refreshingly unpretentious festival, in a delightful setting by the River Aulne in Finistère, maes a determined effort to attract young performers – and spectators (www.fest-jazz.com). The world’s biggest festival of Celtic culture is devoted above all to music and dance, and attracts half a million revellers. The 2013 event will focus especially on Asturias in Spain (www.festival-interceltique.com).